The Congress Working Committee (CWC) will hold a crucial meeting here tomorrow to discuss the current political situation and the challenges faced by the UPA government on the economic front. The meeting of the highest policy-making body of the party will be presided over by Congress President Sonia Gandhi and attended by Prime Minister Manmohan Singh, top Congress ministers, party chief ministers, Congress legislature party leaders and other senior leaders. �Tobacco industry interference�, this year�s theme for the World No-Tobacco Day (May 31), brought with it a strong reminder to India to evolve mechanisms that would ensure complete insulation of its public health policy from any possible interference of the tobacco industry. Cracking the whip on dissidents, the District Akali Jatha Ludhiana (Urban) today expelled nine party workers who were contesting as Independents in the Municipal Corporation (MC) Ludhiana polls. District Akali Jatha Ludhiana (Urban) president Hira Singh Gabria said the expelled party workers were harming the interests of the party by contesting as Independents. Baroness Sayeeda Warsi allegedly threatened to destroy alcohol bottles in the home of the doctor who claims he allowed her to stay rent-free at his London home. HIMACHAL: Bali, Virbhadra trying to mend fences? 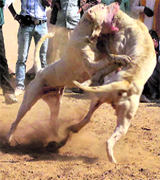 Despite the ban, dogfights and Greyhound races are being reportedly run in certain border districts in connivance with the police and politically well-connected persons. The well-organised racket is run from sprawling farmhouses in remote areas.